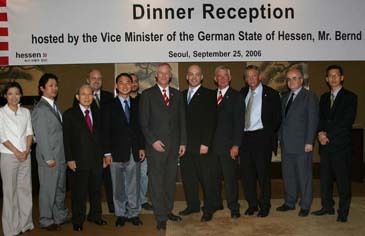 On the occasion of the visit of Vice Minister Bernd Abeln, Ministry of Economics, Transport, Urban and Regional Development of the Federal State of Hessen, and his accompanying delegation, the KGCCI together with the German Embassy organised a delegation programme from the 23rd to the 28th of September 2006 in Korea. The five participants of the German delegation presented their federal state to the Korean companies which had assigned 50 employees to the opening event. 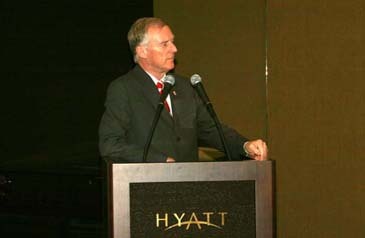 The delegation programme also included a business matching for the German enterprise "GAUFF." On the 25th of September this Engineering Consulting Company met Korean counterparts e.g. "Samsung Everland." "Hyundai Engineering & Construction R&D Center" and "Shingang Hi-Tech Co." and successfully exchanged information. Over the next few days the members of the delegation had meetings with various political and economical associations like the MOFAT and MOCIE. Moreover they visited companies like KOTRA, Invest Korea Plaza, SBA, Samsung, SBC and Merck. One of the most important aim of the Korean-German Chamber of Commerce and Industry is to intensify the business relationship between Korean and German companies. Especially the increasing importance of the renewable energy market offers best conditions for cooperation between both countries. On the occasion of the 21st European Photovoltaic Solar Energy Conference and Exhibition in Dresden the KGCCI in cooperation with the Korea National Renewable Energy Association organized a Korean delegation to Germany. This delegation trip offered a good opportunity to learn more about solar energy in Germany. "Fraunhofer Institute for Solar Energy Systems" — a developer of components, materials and processes in the areas of the thermal use of solar energy, solar building, solar cells, electrical power supplies, chemical energy conversion, energy storage and the rational use of energy.